We live in a very expensive part of California. We are very lucky to live in a subsidized condo. Unfortunately, our condo was clearly designed for a couple with one, maybe two older children – not four very young children! The condo is technically larger than our 1400 square foot Masachustts home, but the extra square footage is in a staircase, hallway, three (!) bathrooms. Unfortunately, this means less space for the kids to play – both indoors and out (we used to have a gorgeous yard). We have two bedrooms upstairs, and one small room downstairs that we have turned into the computer room/library/guest room. How do you fit four beds in one room? Bunkbeds, of course, but it’s a little more complicated than that if you want it to work long-term. Here are my top tips. Give each child their own space. Keep the space as uncluttered as possible. Create space for each child to store their belongings. One of the biggest concerns I had with putting the kids in this sleeping situation – with beds opposite one another – was that they would keep one another up all night. Lily sometimes slept in Emma and Johnny’s room in Massachusetts on a pull-out mattress I kept under their bed as an improvised trundle bed. Sometimes Lily and Johnny would goof around instead of falling asleep. Right now Anna goes to bed after the other kids since she takes a nap, so keeping her and Lily apart is not (currently) an issue. Having the bed tent that goes with the IKEA Kura bed creates an enclosed space for Emma and Johnny so that they are able to relax and fall asleep. I plan to eventually add a curtain of some sort on Lily and Anna’s beds, but haven’t worked that out yet – any suggestions for how I could safely hang a curtain? The kids each have their Expedit bin where they can store anything they like (so far a few treasures, games, favorite blankets, and doll clothes) along with dolls and stuffed animals that they sleep with. The rest of their toys are stored in our living room/dining room downstairs. Their IKEA easel is in the room (in front of the closet), and they use it to play school, make lists, and draw. The only other clutter in their room is a laundry basket, which you can see in the lower right portion of this photo. I don’t love the rugs, but the carpet underneath is pretty ugly and the kids adore them. So the rugs stay! Making bunkbeds is a pain, so their bedding is also very simple. Each child has a comforter with a cover that gets washed weekly instead of a top sheet. This makes it easy for the kids to make their own beds. In hot weather (like the week I took this photo), we pull the comforter out of cover and they sleep just with the cover. These flannel comforter / duve covers keep the kids comfortable on their own during warmer months. Give each child space to store their belongings. I assigned each of the kids their own bin in the IKEA Expedit shelving unit you can barely see on the left of this photograph (I don’t own a wide angle lens, and it is hard to photograph a space this small). I put dressers for Emma and Johnny in the closet (off to the right, not visible). Lily’s clothes are stored in bins that sit on a narrow bookcase between her bed (far wall) and the window. Emma, Johnny, and Lily each own one of the rugs on the floor, although the toys they use with them are stored downstairs. There is a toy box at the end of the far bed where they store their dolls and stuffed animals. There are a couple of other details that make this situation work well. The room’s very large window makes the space feel larger! The ceiling is also low in one portion of the room, but then raises to about 12 feet near the closet. Vertical square footage can make a big difference, as can natural light! Do you have any favorite small space living tips? How about strategies for how to fit four beds in one room? I’m still trying to figure out how to make the most of our concrete patio. If I can get some plants in the raised garden bed I think that will make a big difference! We moved from Arizon to Iowa 12 years ago and I have fallen in love with the midwest…most people migrate the other direction! The question is who will win! It has always been our battle…and so far, I have won…but it seems tougher this time! 1300 square feet with 12 kids is VERY impressive! No wonder you are so good at having fun!!! I was looking at these beds too! My son and daughter share a room and I was trying to figure out a way to give them a space of their own. The tents might just sell them on the idea! BTW, Love your new theme! Emma and Johnny think the tents are pretty awesome! I’ve seen a lot of people who made lovely reading nooks on the bottom of these beds (when they didn’t need a child to sleep there). That’s great! Maybe she feels more of a connection with them now – more like they are all on the same team? Isn’t it amazing how different expectations are based on where you live? It has been interesting to me to move to this home, where we gained square footage, but because it wasn’t designed for family living the way our previous home was, I have had a harder time figuring out how to make it work. I think I’m getting there, though – and the house is feeling much more spacious as a result! No great tips here, a friend of mine had a similarly sized house for 4 kids, and their house always seemed so nice and cozy, and they had SOOOOOO many books in their house when they moved, I think I’m gonna need a new bookcase. I do love the way smaller homes bring families together! And, actually, I love that it forces me to control how much stuff we acquire, too. Thanks for the tips! J loved those beds at IKEA when we went a few weeks ago. My parents saved my childhood bunkbeds to bring when they come up when Miss Baby J is born. We’ll end up just with a lofted twin and a reading area under his bed. J is so excited for his new bed and reading space (inspired by the IKEA display for these beds). I’m still learning about small space living (after 9 years, mainly because we add a family member every 5 just to throw things off a little). I have some experience with gardening in small spaces. I can share my experiences/opinions with you next time we get together. That reminds me – did you figure out what fruit is on your tree? I would love to learn some of your gardening tips! The fruit on the tree is still a mystery – it’s still not ripe! Maybe it’s a grapefruit? Love it! I’m impressed. We have a small house, too (but a huge yard that I couldn’t live without. Our house is probably about 700 square feet and the second “bedroom” that my two boys share hardly deserves to be called a bedroom. We wanted to get that same bed from Ikea as any other bunk bed option would be too long for the room (that’s how small it is), but even that bed was going to be a pretty tight fit when opening the closet door. Then, we realized we could make it work if we took a Montessori approach, so we now have two mattresses on the floor opposite each other like your beds are. It works well for us. We also do a fitted sheet and then a blanket, and these get washed often. However, our boys cannot fall asleep together, so typically big bro falls asleep in our bed and gets transferred to his bed later. As for storage, we put one hanging shelf from Ikea in the room for special books that we prefer the boys to read with some supervision so they don’t get ripped and torn. We also have musical instruments on it that get pulled out sometimes. There’s a small (very small) dresser for their clothing that is completely at their height so they can both get out their own clothes in the morning and their own jammies at night. We also have two small containers that are easy to move that have toys and books. The biggest thing about having a small house is that it helps us keep toys and such to a minimum, which I love. Thanks so much for sharing your space. I’m impressed with how you’re making it work! Brilliant! When we were looking at 1000 square feet I was planning to have hte kids sleep on mattresses that could be rolled up during the day, Japanese-style. These bunk beds make it easier for them to all fall asleep in the same room, though! I loved hearing how you have made a small space work – sounds brilliant! I love this post. It is inspirational and makes me want to get off the computer and go organize the kids’ bedroom! We had 4 kids in our last house (1100 sq feet). We had two built in bunk beds side by side across the room with built in shelves at the head of each bed for the 4 boys. And I had a set of lockers for organizing. I’m not sure what to do now – we have 3 in a room still, but they are getting older and I’m wondering about my only daughter (7 years old) needing her own room (or space) now. The boys are 9 and 3. Do you think there is age limit on boys and girls sharing a room? (2 older boys share a room (13 and 15 ys) and the 17 year old has his own room now. Oh, and love the Ikea layout! So wish we had an Ikea closer to us! I had cousins who shared a room straight up until college – two girls and a boy, and a family here who had four kids in one room (one boy and three girls) until the oldest child was 15 and it worked. It’s fairly recent that your average family has the space to separate children out by gender the way we do. Good luck figuring out a layout that will work for you as your children grow older, and I hope you DO get an IKEA nearby someday. They are very useful stores! I would have LOVED a bed tent as a kid! I think they help the kids feel safe and cozy. Love this!!! 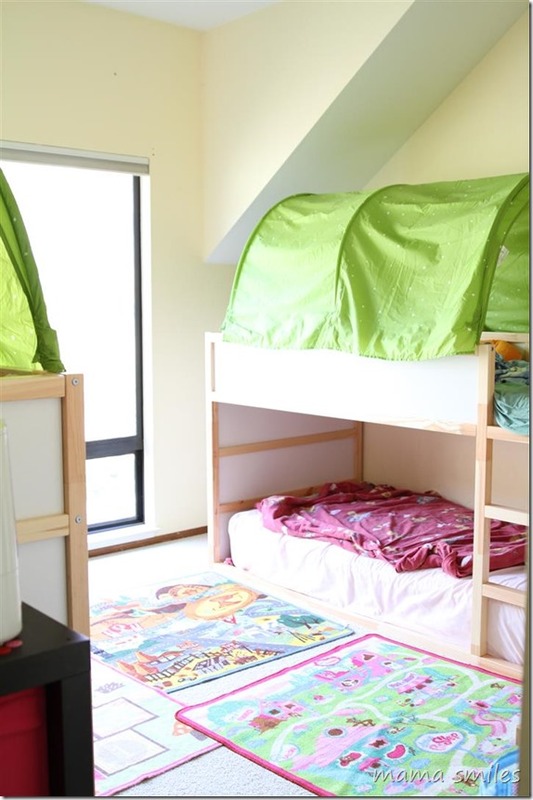 The enormous window and angled ceiling make the room so inviting, and those bed tents are a wonderful idea! Low bunks are great for safety and practicality of replacing bed linens, too. As an experiment, I let my kids put up sheets as curtains on their bunks. They were just jammed under the mattress above, and the kids loved them during the winter, but during the summer the older kids on the higher bunks took theirs down complaining it was too warm (and of course the youngers followed suit). So I’m still mulling it over, but my current thought for when we need curtain privacy on the bunks is that I will use a very light-weight material on a curtain rod with the curtain having grommets threaded through the rod. I think that will be safe, easy to shove aside, and hopefully not too hot. An alternative might be velcro, which would be safe, easier to remove for cleaning, but harder to shove aside. I’d love to hear what you come up with. Oh, and don’t get me started on architects using valuable floor space for things like hallways… I think you’d agree with the principles behind Sarah Susanka’s book, The Not So Big House (even though many of her examples are bigger homes, and all of the families seem to have fewer children than we have). That’s interesting that the curtains got too warm in the summer. Good to know. I just told my mom about your recommendation of Sarah Susanka’s book, and she bought it – my dad retires this fall and they will be looking for a home to move into after nearly three decades of moving from country to country. Lots for them to think about! Wow! You got really creative with that space. It looks great! Fortunately, we live in a nice sized home with plenty of space for all seven of us. with Have a terrific Wednesday! I agree that small spaces are much nicer when it comes to cleaning especially, but also for keeping family members close. Good idea with the bunk beds and tents! I have all three boys in one room. They’re fine for now since two of them are still in cribs. Eventually I plan to put two of them in bunk beds, and I really like that tent idea. We’re also big on decluttering and keeping things minimalist. They have a changing dresser and a low bookcase for toys and books, as well as two storage bins for more knick knacks and toys. I also bump all the beds and cribs as close to the walls as possible to maximize floor space. Sounds like you have a great setup for your space! We live in a duplex house that is 2,000 square feet total–our side is 1,000 feet. Right now our son has a small room to himself, but if he ever has siblings…your ideas are wonderful. Four in a room…I can imagine that will be a fun memory for your kids when they get older! I agree, I think they will remember it fondly! You were very creative with your space! I have to work on decluttering. Our house is about 2000 square feet and plenty big, but the girls share a room and right now there is just too much stuff in there. I also want to add that posts like this are always my favorites!!! I love tips! I love those tent beds from IKEA! They look so darn cute in your room. My hat is off to you and your organization! We are lucky. We live in Texas. Everything is bigger in Texas. We live in a small home byTexas standards but both of the kiddos are lucky to have their own bedroom. MacGyver is my biggest organization problem. He is our absentminded professor who is constantly collecting, inventing and creating. It is wonderful and overwhelming all a the same time. some great tips for me… especially since our youngest 2 are going to share a room. and I love those beds! I’ve been considering one. especially love the tents on top. We have been really happy with these beds! 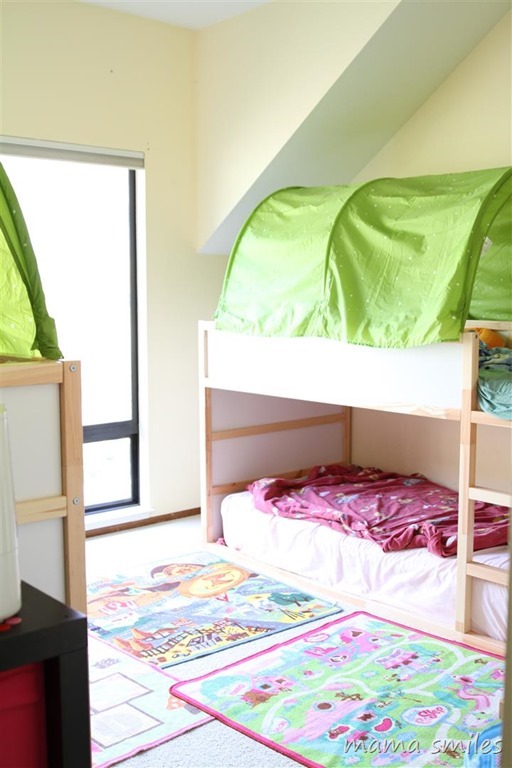 The tents are a lot of fun, and it makes a nice cozy space for the kids to sleep. I love what you’ve done with the room – especially the bed tents! You are so creative – I can’t wait to see what you do with the patio! Thank you, Jody! I am trying to figure out the patio – outdoor spaces are harder for me, somehow – but I’ll work something out. Great job on maximizing space! I also hate making bunk beds. Thankfully we just got rid of one so my kids are bunk bed free! Congratulations! Someday we will be bunkbed free, I think, but it’s a few years away! We put a 12 inch deep IKEA pax wardrobe system on one wall of the boy’s room. It’s only 7 feet wide at its widest spot but we used mirrored doors so it seems a bit wider. No getting around the fact that it is super small, though! We use the Kura as a bunk bed, too. Although my 5 year old still mostly sleeps with me! Brilliant! Mirrors make a huge difference. I think I need to put some up in our somewhat dark downstairs to brighten things up a bit. Anna still mostly sleeps with me, and I imagine Lily would as well, if she thought she could get away with it. I have no idea how old this post is, but all of this looks fab! Im very impressed at how much space you’ve created in so little space!! Also, for a curtain, use velcro, have a strip on the upper inner lip, that velcro’s the top of a curtain in place, that way the kids can attach and detach easily and safely! I wish I could see the underside of the bunk better -here’s what we did: My daughter has bunks with a curtain across the bottom. We just tucked it in under the outer edge of the mattress so it hung at the length that we like. She pulls it over to the side when she wants to get in. My other suggestion would be a tension curtain rod that fits between the wood at the foot of the bed and the ladder — then the curtain could be on loops or rings and easily moved back and forth to get into the bed. I also like the velcro suggestion above! I’ve been looking for a small space bed for the little boys for months! This is perfect! We are getting this one from ikea today, in fact. I asked you this on Instagram too, but will also leave a comment…what mattress are you using with the Kura? I see several on the ikea site, but wanted to know which you prefer? And, you only used the bent slats on the bottom, not the top bunks? I’m excited for their new bed :)! I think your boys will love this bed – my kids sure do! We use the Sultan Florvag mattresses (Lily’s on the bottom is an old non-IKEA mattress we already had). The bunkbed comes with straight slats for the top bunks, so you only need to buy slats separately for the bottom. I think the room looks great! I’ve seen those beds used as bunks before too! I was trying to think of a way to add curtains, and I think the safest way would be to use a strip of sticky backed velcro along the bottom of the top bunk, then a strip of velcro along the top of the curtain. That way if it comes down it can easily be stuck back on and no one is in danger of getting hurt like there would be if you used a tension rod or wire or something like that. For the curtain on the bottom beds you could just use a tension rod or you could buy a regular rod and screw it into the bottom part. It’s what we did and it works just fine. I Meg, I would love to see pictures! You can email me – mamasmilesblog at gmail dot com. Thanks! There was a woman who lived in a shoe… ;) Got 4 kids in one room too. We live in 770 sq ft in California as well. Don’t have a patio but I am a firm believer in homesteading and so I would do whatever I could to make it productive and get the kids involved in it as well. Keep the toys simple! They are allowed to have 3 toys on their shelf. Everything else goes in a tote in the shed and they can swap the toys out but only 3 on the shelf. We are about to move into a smaller house. This was a timely find!